This is a scalable context timeline. It contains events related to the event August 22, 1998: Mullah Omar Calls State Department and Expresses Interest in Confidential Dialogue. You can narrow or broaden the context of this timeline by adjusting the zoom level. The lower the scale, the more relevant the items on average will be, while the higher the scale, the less relevant the items, on average, will be. 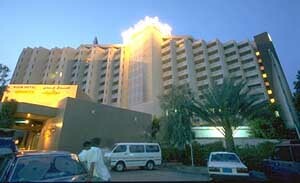 The Movenpick hotel in Aden, Yemen. [Source: Al Bab]Bombs explode at two hotels, the Movenpick and the Gold Mohur, in Aden, Yemen, killing a tourist and a hotel worker. US soldiers involved in an operation in Somalia are sometimes billeted nearby, but none are killed or injured in the blasts. [Bergen, 2001, pp. 176; Scheuer, 2006, pp. 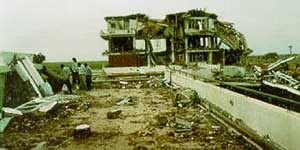 147] US intelligence will conclude in April 1993 that “[Osama bin Laden] almost certainly played a role” in this attack. However, there will be little chance of a successful prosecution due to lack of evidence. [Bergen, 2001, pp. 176; US Congress, 7/24/2003] Other operatives involved in the bombing are reputedly “point man” Tariq Nasr al-Fadhli, a leading Afghan veteran and tribal leader who will later live on a Yemeni government stipend, and Jamal al-Nahdi, who reportedly loses a hand in the Movenpick blast. [New York Times, 11/26/2000] The Yemen government will send an armored brigade to arrest al-Fadhli and he will eventually surrender, but soon be set free. Author Peter Bergen will comment, “[T]he Yemeni government seems to have developed amnesia: al-Fadhli became a member of the president’s personally selected consultative council and his sister is married to General Ali Muhsin al-Ahmar, a member of President Saleh’s family; al-Nahdi is a businessman in Sana’a and a member of the permanent committee of Yemen’s ruling party.” [Bergen, 2001, pp. 176] The US will announce that it is withdrawing from Yemen shortly after the bombings (see Shortly After December 29, 1992). Sayyid Iskandar Suliman. This picture is from a poor photocopy of his passport found in Sudanese intelligence files. [Source: Public domain via Richard Miniter]On August 4, 1998, Sudanese immigration suspects two men, Sayyid Nazir Abbass and Sayyid Iskandar Suliman, arriving in Sudan, apparently due to something in their Pakistani passports. They attempt to rent an apartment overlooking the US embassy. Three days later, US embassies are bombed in Kenya and Tanzania (see 10:35-10:39 a.m., August 7, 1998). Within hours, Sudanese officials arrest Abbass and Suliman. The two of them had just come from Kenya, and one of them quickly admits to staying in the same hotel in Kenya as some of the embassy bombers. Sudanese intelligence believes they are al-Qaeda operatives involved in the bombings. [Observer, 9/30/2001; Vanity Fair, 1/2002; Randal, 2005, pp. 132-135] The US embassy in Sudan has been shut down for several years. But around August 14, a Sudanese intelligence official contacts an intermediary and former White House employee named Janet McElligott and gives her a vague message that Sudan is holding important suspects and the FBI should send a team immediately to see if they want to take custody of them. [Randal, 2005, pp. 132-135] The FBI wants the two men, but on August 17, Secretary of State Madeleine Albright forbids their extradition. 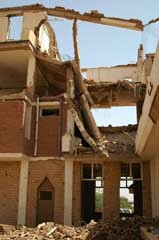 The US has decided to bomb a factory in Sudan in retaliation for the embassy bombings instead of cooperating with Sudan. But FBI agent John O’Neill is not yet aware of Albright’s decision, and word of the Sudanese offer reaches him on August 19. He wants immediate approval to arrest the two suspects and flies to Washington that evening to discuss the issue with counterterrorism “tsar” Richard Clarke. But Clarke tells O’Neill to speak to Attorney General Janet Reno. Later that night, O’Neill talks to Reno and she tells him that the decision to retaliate against Sudan instead has already been made. 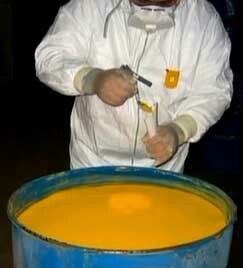 Mere hours later, the US attack a factory in Sudan with cruise missiles (see August 20, 1998). Within days, it becomes apparent that the factory had no link to al-Qaeda (see September 23, 1998), and no link between the bombings and the Sudanese government will emerge (although Sudan harbored bin Laden until 1996). [Randal, 2005, pp. 132-138] The Sudanese will continue to hold the two men in hopes to make a deal with the US. But the US is not interested, so after two weeks they are send to Pakistan and set free there (see August 20-September 2, 1998). State Department official Michael Malinowski. [Source: Reuters / Corbis]Two days after the US missile strikes on militant training camps in Afghanistan (see August 20, 1998), top Taliban leader Mullah Omar unexpectedly telephones the State Department in Washington. He talks to Michael Malinowski, office director for Pakistan, Afghanistan, and Bangladesh in the Bureau of South Asian Affairs. Although Mullah Omar does not threaten the US, he suggests that the missile strikes could spark more terrorist attacks. He says the Taliban is open to the idea of establishing a secure communication channel with US officials, possibly through the US embassy in Pakistan (there is no embassy in Afghanistan). The State Department comments, “Omar’s contact with a US official is rather remarkable, given his reclusive nature and his past avoidance of contact with all things American.” [US Department of State, 8/23/1998 ; US Department of State, 1/14/2002] The US then sends the Taliban some evidence of bin Laden’s militant activities (see August 23, 1998), but it appears the secure communications channel never materializes. After being asked by Taliban leader Mullah Omar (see August 22, 1998), the US sends the Taliban a cable about bin Laden’s activities. The cable states, “We have detailed and solid evidence that Osama bin Laden has been engaged and is still engaged in planning, organizing, and funding acts of international terror.” However, the sections on the various plots in which bin Laden is supposed to have been involved are brief and do not include supporting evidence. For example, the Yemen bombing in 1992 (see December 29, 1992) is described in a single sentence: “Bin Laden and his network conspired to kill US servicemen in Yemen who were on their way to participate in the humanitarian mission ‘Operation Restore Hope’ in Somalia in 1992.” [US Department of State, 8/23/1998 ] Afghanistan’s supreme court will later acquit bin Laden of his involvement in the 1998 embassy bombings (see (October 25-November 20, 1998)) because of the US’s refusal to provide the court with the requested evidence. According to Saudi intelligence minister Prince Turki al-Faisal, he participates in a second meeting with Taliban leader Mullah Omar at this time. Supposedly, earlier in the year Omar made a secret deal with Turki to hand bin Laden over to Saudi Arabia (see June 1998) and Turki is now ready to finalize the deal. ISI Director Gen. Naseem Rana is at the meeting as well. But in the wake of the US missile bombing of Afghanistan (August 20, 1998), Omar yells at Turki and denies ever having made a deal. Turki leaves empty handed. [Wright, 2006, pp. 244] However, other reports stand in complete contrast to this, suggesting that earlier in the year Turki colluded with the ISI to support bin Laden, not capture him (see May 1996 and July 1998). Shortly after an August 1998 US missile strike on Afghanistan (see August 20, 1998), bin Laden stops using his satellite phone, correctly deciding that it was being monitored by US intelligence (see Late August 1998). According to counterterrorism expert Rohan Gunaratna, al-Qaeda quickly “developed a system to deceive those monitoring his calls. [But] Western security and intelligence agencies were soon able to monitor the new system, which was based on transferring international calls within safe houses in Pakistan to make them seem like domestic calls.” Other al-Qaeda leaders such as Abu Zubaida will be frequently monitored as they make calls using this new system (see October 1998 and After). Gunaratna later claims to have learned this from a confidential source in a “communications monitoring agency” in Western Europe. [Gunaratna, 2003, pp. 15-16, 3291] It is not known how long it took until al-Qaeda realized this new system was compromised, but there are accounts of bin Laden and Zubaida’s calls being monitored days before 9/11 (see Early September 2001, September 9, 2001, and Early September 2001).